Tracie Morris is a writer, sound poet, critic, scholar, bandleader, actor and multimedia performer. She is the author of Intermission, Chap-T-her Won, handholding: 5 kinds, Rhyme Scheme, and was co-editor, with Charles Bernstein, of BAX 2016: Best American Experimental Writing. Her sound installations have been presented at galleries and museums, including the Whitney Biennial, MoMA, The Philadelphia Museum of Art, Ronald Feldman Gallery, The Silent Barn, The Jamaica Center for Arts and Learning, and The Drawing Center. She leads her own eponymous band and is a lead singer for Elliott Sharp's group, Terraplane. Morris has earned numerous awards and fellowships for poetry and performance, including New York Foundation for the Arts, Asian Cultural Council, Franklin Furnace and Creative Capital fellowships as well as residencies at Millay, Yaddo and MacDowell colonies. 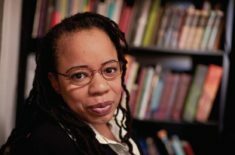 She is a former Poetics fellow of the Center for Programs in Contemporary Writing at the University of Pennsylvania, a Cave Canem Fellow, and Professor and Coordinator of Performance and Performance Studies at Pratt Institute, New York. Morris holds an MFA in Poetry from Hunter College, a PhD in Performance Studies from New York University, and has studied at the Royal Academy of Dramatic Art in London and at Michael Howard Studios.